My daughters will attest to the fact that, during their “growing up years,” I didn’t stop asking them questions intended for them to think about science, math, vocabulary, etc, as we went about our day. Yup, I drove them crazy all right (I still do!). Best of all was when I cooked with my girls…spending time together creating magic and yummy things for us to share as a family. I’d ask them questions as we cooked, and sometimes they would answer. Mostly though, the time together wasn’t just making food…it was making memories. Baking homemade challah combined all these aspects into a wonderful bonding experience. When it comes to baking, especially baking with kids, making bread is an ideal platform from which to ask questions. There is so much to see and do, so many ways to teach and learn! First, you’ve got the wonderful aspects of science and math. When I would help my preschool students make challah (egg bread) every Friday, we would talk about “waking up and feeding the yeasties” while preparing the dough, and I’d talk about how yeast is actually a living organism that makes the bread rise. I’d ask them questions like “how many ¼ cups of water would go into 1 cup of water?” instilling in them the thought that math is something we use every day. Learning to be careful when measuring out the ingredients taught them patience and control, as did stirring the ingredients carefully and watching how the dough takes shape in the bowl. Then there’s the tactical, hands-on experience of shaping bread dough…these 3- and 4-year olds loved the feel of mashing and smashing the dough into whatever shape they chose. Some kids even allowed me to teach them how to braid a 3-strand loaf, pretty enough for any bakery. Then we would brush their creation with egg wash and (for those that wanted) sprinkle a little cinnamon sugar on top. I wish I had pictures of my students’ challahs, but alas, I do not (privacy issues…you understand). I’d make challah alongside theirs with the extra dough, so these were mine. Finally, there’s the magic of seeing that, while a smooshy dough that smelled a little tangy went into the oven, out came bread that was fluffy on the inside with a golden-brown crust that spelled rich and satisfying. Amazing! While I would put the finished bread into a bag for the kids to take home, many couldn’t wait to show whoever was picking them up what they made…then eating it on the spot! I’ve made challah for many years, for many occasions, in a variety of shapes. I’ve added chocolate chips or raisins to the dough, and have varied the toppings from the traditional sesame or poppy seeds to cinnamon sugar (the kids generally like that one!). Traditionally, challah is braided…a 3-strand braid is easiest, but you can find round challahs or other fancy shapes. I learned to make a very professional looking 6-strand braid…if you’re adventurous, I have instructions (with pictures) on how to do it. You can modify the 6-strand to a 4-strand using the same technique (that’s how the challahs in the header picture above were braided). 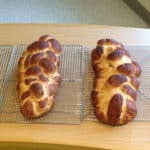 Here’s my time- (and kid-) tested recipe for making challah. Enjoy! Mix all the ingredients in the order listed into the bowl of a stand mixer. 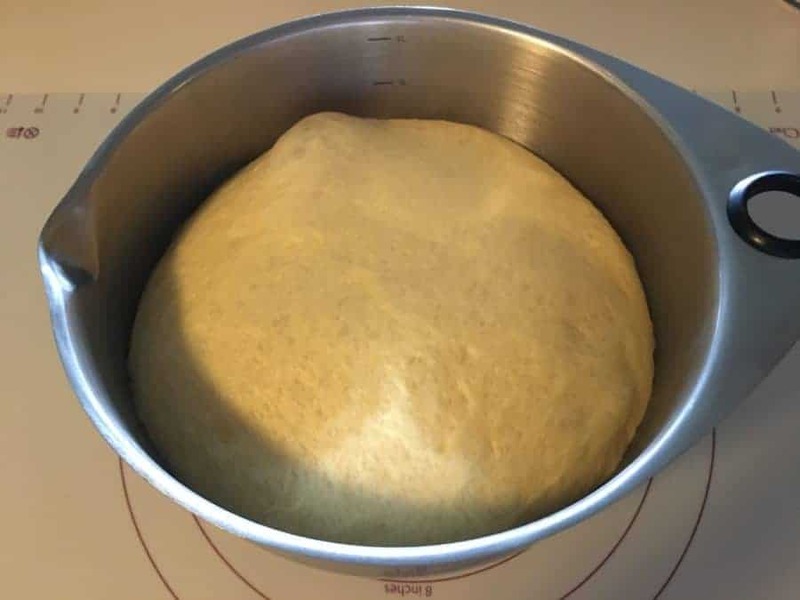 Knead the dough with a dough hook for about 5 minutes - OR - mix the ingredients in a large bowl using a wooden spoon until it’s too stiff to stir, then turn out onto a floured surface and continue kneading until a smooth dough forms. Knead about 5 minutes more. If the dough seems too wet, add more flour, 1 Tbsp at a time, until the dough is slightly tacky. Place in a covered, oiled bowl and let it rise 4 hours in a warm place (such as in the oven, turned off but with the light on) until it doubles in bulk - OR - let it rise in the refrigerator overnight. Note: you can freeze the dough wrapped well in plastic wrap for future use if you’d like. Let the dough come to room temperature if refrigerated (about an hour) or frozen. Shape the dough however you’d like. Brush the top of the dough with an egg wash (1 Tbsp egg mixed with 1 tsp water), then sprinkle on any desired toppings, such as cinnamon sugar, sesame seeds, or poppy seeds. Let the shaped dough rise for 45 minutes on a parchment-covered baking sheet in a warm place. Towards the end of the rising time, preheat the oven to 350ºF. If you’re letting your dough rise in the oven, you can let it stay there while the oven is heating (just make sure you start the baking timer once the oven has come to full temperature). Bake the dough for 25-35 minutes until golden brown and it sounds hollow when tapped on the bottom. The amount of water will depend on the humidity of the day you’re baking. Start with the lesser amount and add 1 Tbsp as needed if the dough looks dry. Baking homemade challah satisfies that need (at least for me) of producing something that feeds my family’s soul as well as their hunger…something we took the time to create just for them, and making it together produces priceless memories. It’s also a way to observe the natural world in a microcosm. So set aside some time and bring the kids into the kitchen…let them help and learn along the way. Regardless of what comes out, it’s time together that’s not to be missed. As usual very informative and entertaining , makes me wish I was in the kitchen with this family ? Thanks for your kind words, Dianne!